A suggestion to Dr. James Hansen: go protest coal in China | Watts Up With That? Now have a look at this graph and narrative I found from the same source as the one above. What the chart doesn’t tell you is the composition of each country’s energy consumption. While many are aware the US is a heavy user of oil, there is less attention paid to China’s heavy use of coal. Let’s compare the two, shall we? Oil in the US represents nearly 39% of total energy use from all sources. But in China, oil barely represents 19% of total energy use. Most important of all: China’s coal use is four times its oil use. Dr. Hansen, I’ll gladly take up a collection here for you to buy you a round trip ticket to any place in China you wish to go and protest, in the same manner you have done here in the USA. Just say the word. Read the rest at the Air Vent here, and be sure to have a look at the graph showing China’s plan for airport expansion. November 15, 2010 in Energy. China, India, Brazil, many other developing countries can grow faster, create more jobs and lift more of its people from poverty with cheaper energy prices. When people are wealthier, they tend to have cleaner environment and less pollution. The anti-coal, anti-cheap energy activities by the warmers is also an anti-development, anti-poverty campaign. Yes but… China is a ‘developing country’ – isn’t it OK for them to be heavy polluters? The Australian politicians via the MSM keep telling us that we have the highest per capita CO2 emmissions in the world and we should be doing something about it (like a CPRS – Carbon Pollution Reduction Scheme – I love that little acronym :-}). Besides we are going to fix the problem by putting a super profits tax on the miners who supply a lot of the coal to China – that’ll slow ’em down a bit! Well, in this case, let us hope that we (the realists, a.k.a “deniers”) are indeed correct, because there really isn’t any turning around. Talk people slowly becoming accustomed to prosperity out of there newly found lifestyles. Then come back to me and tell me what they say when you tell them electricity will destroy their futures. Oh yes, I mean “…the warmers is also an anti-development, pro-poverty campaign.” Thanks MJ. The ecological socialists and their global ecological central planning agenda is really evil. I’ve read a couple of projections regarding coal consumption by US DoE and IEA… they’re supposed to know about these things, right? Both forecast CO2 emissions growth by 30-40 % by 2030, due mainly to increased coal use by developing countries. In order just to maintain 2010 global status quo emissionwise, the US, EU and Japan would have to cut down their emissions to zero in 20 years. I don’t see it happening. I can’t really blame developing countries for burning the coal. India has 400 million people without electricity. That is correct. Per capita, we do (Australians – OK, I am an import, a volunteer import, I didn’t steal a loaf of bread) “pollute” more. Using a per capita figure is misleading when comparing 1.4billion people to 21million, but it SOUNDS more scary. As we say in Scotland: “Get it right up ye Dr Hansen”. …But then again, I don’t suppose the phrase “Chinese gulag” holds much appeal for you? Please don’t wrap India together with China here. India’s total coal consumption grew from 388134 to 680873 thousand ton between 1999 and 2009 while China went from 1305219 to 3308653 thousand ton, or 500% more then India. The US went from 1038647 to 10008424 thousand ton over the same 10 years, or about 30% of China and declining. Oops, the US consumed 1000424 thousand ton of coal in 2009. Surely it would be a waste of money getting James Hansen a round-trip China ticket? In China he would get locked up for so long everyone will have forgotten who he is. A one-way ticket would be plenty enough. No no no…. the whole point about China is that WE have to set the example. We can’t expect them to change if we don’t set a shining bright successful example. It is all explained in the book, What About China? Remember, YOU have the power to make a difference! Don’t wait for the world’s politicians, especially those from other countries, to do it for you. That would NOT EMPOWER YOU. YOU need to be EMPOWERED. I BELIEVE THAT YOU, NEO, ARE THE ONE. I suspect if Hansen did the same in China as he has done in the US, he’d be in jail for a long time, and that might not even have to include protesting. Exactly why are the skeptics being hit up for a plane fare? Would not the best strategy be for the warmists to put up a few bucks to send him? Oh, I forgot. They are adamant about doing stuff to save the environment as long as the stuff doesn’t come out of their pockets. Actually I think the way it works is they are the ones to take stuff out of our pockets to put it in different pockets that can be painted green. Problem being that the green pockets wind up with some stuff in them, its not very good stuff, and there’s always some stuff missing because someone stuffed their own pockets with it. The UK Government has just passed the Climate Change Act – the most lunatic piece of suicidal legislation any government has ever passed. True, it is the legacy of the Labour Closet Communist Party, but the current coaition hasn’t actually thought through the result of attempting to reduce CO2 emmissions by 80% (Yes, that’s right!) by 2020. I wonder if the Greenpeace, Fiends of the Earth supporting parasites on their Social Service benefits realise that once they complete making the UK an energy free zone – their ‘benefits’ will also cease. I was under the impression that it was illegal in the US for government employees to undertake such protesting. Seems OK for Hansen though. If Hansen went to China to protest it would be a one way ticket. They might insist he stay- in one of their lovely prisons. What do mean buy him a plane ticket! Jim wouldn’t fly because it is to big a carbon footprint. I wonder what China’s reserves of natural gas amount to. They will develop the infrastructure to deliver it to domestic and commercial consumers eventually. Seems MS Gillard will charge ahead with a carbon pollution reduction scheme with the resulting and continuing export of jobs, and coal/gas, from and the import of taxes to Australia. Don’t worry – we’ve actually got until 2050 for the 80% cut. As long as we delay the shutdown until 2049 it probably won’t effect me too much..
Dr. Hansen, I’ll gladly take up a collection here for you to buy you a round trip ticket to any place in China you wish to go and protest at, in the same manner you have done here in the USA. Just say the word. Anthony, a Hansen round trip ticket does not work for me. Organize a one-way ticket to China and I will contribute what I can to send him first class on the first available flight. The MTOE graph, has a Y scale starting at 2100 MTOE: this is misleading. If the scale started at 0, the difference between the BP and IEA would be seen to be trivial. Don’t waste your money, I don’t suppose the Chinese would even let him in. Imagine the visa application – purpose of visit – to protest against coal fired power stations. Ah yes, Dr Hanson, like you did in England? Visa refused. According to the World Nuclear Association, the Socialist Republic of Vietnam has more nuclear reactors on order or proposed (14) than the UK (13). The USA has 21 on order or proposed while China – no surprise here – beats everyone with 39 on order and 120 reactors proposed (169 total). China, India, Brazil, many other developing countries can grow faster, create more jobs and lift more of its people from poverty with cheaper energy prices. When people are wealthier, they tend to have cleaner environment and less pollution………. And they tend to have fewer children. I have left out China for their 1 child per couple policy. The Socialist agenda has infected the education system in the West for many years and has made it easy for kids to become Warmist idealogues as they advanced through the system to adulthood without ever having to think about the issues involved. In the case of New Zealand, the Science syllabus for schools was changed in the 1990s and the importance of the basic process skills in science were relegated to a minor role in the subject and the the wooly thinking of Post-Modern science , which is not science at all but a disastrously mad and imprecise philosophy, was introduced. On top of this, CO2 was assigned it’s supposed starring role among the greenhouse gasses in the dogma of Anthropogenic Global Warming at the same time. Many in science education at that time promoted their new religion in schools with Messianic zeal. To my own later embarrassment, I clearly remember being ‘sucked in’ and accepting the gospel as preached by my opposite numbers in the science department at the high school where I was head of the Arts faculty. I didn’t think too much about science topics at that time as I had suficient issues to deal with in my own professional area, as the approach to teaching and examining the arts had been altered along with science, as the politicians of the day considered that examination passes in the practical areas of the arts such as painting, print-making sculpting, photography and design were ‘too high’ and therefore lacked academic rigour, when the real problem was one of politicians being unable to understand education and its delivery. After coming to spend my last years of teaching before retirement from the profession in the UK, I was absolutely astonished to discover that UK politicians don’t understand that half of any population must be, by definition, below average on any indice. That these same politicians, regardless of party affilliation, refuse to easily give up the chance to impose ridiculous and dishonest taxes in some sort of mad attempot to mitigate against the effects of the evils of CO2 despite any evidence that what they are attempting is pointless, mad, and doomed to fail is absolutely unsurprising. As to the clear and logical evidence that the utter fatuity of ‘leading by example’ of reducing this country’s CO2 emissions this article presents, I doubt that more than a tiny minority of politicians could read the text and the graphs with any real understandings. I suspect that the awakening will be long and uncomfortable for all of us. Thanks, Mods. You do a brilliant job! entitled “The Case for the Australian Coal-to-Liquids Industry”. transport fuels. Power generation will go nuclear. If we were a smart species, the sooner that nuclear is thorium in molten salt reactors, the better. I noticed they didn’t answer the question, like in so many other cases, and only pretended to answer. It is one of the fascinating aspects of the CAGW crowd that they are happy to outsource their CO2 emissions to China and pretend it doesn’t matter. That includes the Holy Hansen who by raising electricity prices here will guarantee that more industry that depends on electricity will move to China. A great post David, unfortunately, we prove, almost each day, that we are far from smart. Now swap “we” with insects, viruses and phages, you’d be on to something. Hanson is a hypocrite. He is out to bring down industrialized America to secure the future of his grand children. He and his ilk (Gore of course) even question the Union stating it would have been better if Lincoln hadn’t saved it. These people are no Americans. They are the worst kind of ideologue profiteers last seen in the USSR. This is what makes me mad far more than the debate about whether AGW is real or not. The fact is that manufacturing jobs have been exported from the US and UK on a massive scale. Those jobs have been exported from nations where much of the energy is from nuclear or natural gas, to nations that simply burn more coal. Then the manufactured goods are shipped back on container ships that burn collosal volumes of “bunker oil”. Stangely enough this activity was not covered by Kyoto. I believe we should break ground on a nuclear power plant each month – until we can do it more quickly. I believe we should displace a small mountain of coal out of electricity – and use it to make pristine clean diesel and jet fuel. So, nuclear displaces coal; coal displaces imported oil. Next, since we use as much oil to heat homes in the North East as is needed to keep nearly 10 million cars on the road, we need to displace that imported oil with natural gas. Finally, we need to build out the nationwide infrastructure to use natural gas in a serious way on the highway. As of this writing, natural gas is 1/3 the cost of petroleum per equivalent energy content. Those sound to me like major “shovel ready” jobs programs that (by keeping our coal usage essentially where it is) would displace dirty, expensive, imported oil with cheaper, cleaner, domestic natural gas and nuclear power. We just have to recover the can do spirit that built the Alaska Highway in seven months and put a man on the moon within a decade. Once upon a time a group of cells in a ceratain body, get together after having arrived at the conclusion that there was a way to get the Global Governace of the whole body where they lived in. So they began preaching that the world was going to end if all the cells do not begin by diminishing the nasty production of CO2 gas. Those “intelligent, superior and highly intellectual and most selected cells” which conspired and experienced such an unexpected outcome” were called “Cancer Cells”: Everytime they succeed…..unfortunately destroy its world. My observation of Mr. Hansen is that he is out to destroy American jobs of industries that he doesn’t like (for example, calling for oil executives to be tried for “crimes against humanity and nature”), while at the same time enriching himself with Climate Ca$h from the U.S. taxpayer. Did you know that GISS employees received pay raises in 2009 while the U.S. economy was tanking (and friends of mine in private industry were being laid off)? Great post, worth the read. We need more nuclear power. They would probably welcome him with open arms. By attacking coal, he wants to throw the struggling U.S. economy an anchor, of which they heartily approve. He could try to attack coal there all he wants. He’d be alone at any “protests”, and they’d just snicker at him. China does have a real pollution problem, but they are addressing it, installing scrubbers and monitoring systems. They are probably about where the U.S. was in the 70’s, with regards to pollution control. The Chinese will play the C02 game, paying lip service to the “threat” of CAGW, but only in a way that they gain an advantage. There’s plenty of room in empty containers returning to the “Colossus of the East”. Understand most are empty. And the carbon footprint is about as low as one can get if the refrigeration unit is cut off. Work was heavy, laborious and dangerous. BUT with the advent of coal, then oil and gas this all changed. Things started to get better, farmers got mechanised, their was more food, more money therefore more investment in science and technology and therefore better medicines, hospitals, schools, transportation of people and merchandise, warm homes, mechanised work alievated the human worker and promoted him from a beast of burden to a machine operator at least. Now, Dr. Hansen and his cohorts want to reverse all this, wanting instead to start using the windmill again, a thing that our forefathers abandoned 200 years ago. All this, Dr. hansen et cohorts are basing on a failed (psuedo-) scientific theory that was proved wrong by the earth itself, this refusing to obey Dr. Hansen’s predictions of doom. They want us to start suffering what our ancestors suffered so much of and worked so hard to get out of. Our ancestors gave up their lives to build a democratic future for us based on knowledge, science and CHEAP ENERGY. Hansen et cohorts want to reverse all this and send us back to the level of hungry beasts fighting over a morsel of bread, while they would be eating cake in their gilded palace. These people(?) should be tried for crimes against humanity. If not, they will cause more deaths than the black death. I’m with Verity’s suggestion . . . a one way ticket . Give me a Hat-Tip or acknowledgement in your story! I wrote the guest post at The Air Vent that you link to ….. Between China and India, 75% of the people heat, cook and burn on coal, wood, charcoal and other trash. This won’t change much even when they use less coal for electric. A couple years ago New Hampshire had a “NH Governor’s Climate Change Task Force” with a lofty goal of stopping dangerous climate change by changes in how New Hampshire produced and used energy. While there were similar efforts in other states, if New Hampshire reduced its CO2 emission to zero, the savings would be wiped out in 13 days by China’s growth. I pointed out that had the task force been serious about reducing CO2 emissions, they would focus on providing assistance to China to make more efficient power plants, and use the opportunity to reduce soot and SO2 emissions too. The task force’s attention was on conservation and I recommended that they should make conservation their focus instead of riding on AGW’s coattails. As expected, my input (and Joe D’Aleo’s) changed not a word in the final report. Whether my comments resonated with anyone is unclear. The task force has morphed into a public/private group that occasionally meets to talk about their conservation activities and the savings and expenses therein. Stonyfield Yogurt saves something like $8,000,000 per year thanks to intelligent use of solar and a mainly through a digester that takes waste product and make methane for process heat. So Margaret Thatcher should in theory be a hero not a villain to the Warmist brigade. The political over scientific dimension to AGW sticks out like a sore thumb. Apparently this “global conspiracy” happened outside most of “our” awarenesses. I was sorta convinced of AGW global warming because of the scientific publications I had been reading. But I knew the science was/is never settled, so I kinda smelled a rotten fish. So I had to do my own research, thanks largely to sites like WUWT with great essays and intelligent commenters and many links. Now that we know about the conspiracy and its timing, it is time to fight back. We need to names names (of course, we already know many of them) and look to the funders of this giant fraud/scam. Put as many of them in jail — long sentences — as possible, plus fine them and return ill-gotten gains to societies. Parents and grandparents can examine the science and “social studies” of every preschool, elementary, and secondary school in which their little ones are enrolled. Demand to present the accurate science and the scientific method. Offer to string up (should I self snip?) any teacher or administrator who refuses. Take the issue to PTAs. Take the issue everywhere. The U.S. has begun the counteroffensive with the Tea-nami. This is just the beginning. Have faith and roll up your sleeves. One other comment. Why does everyone think that declining birth rates are so negative when these happen under conditions of prosperity (of course, LIA and its consequences is another matter)? We have always known that with technological advances we do not need so many workers — but we do need many jobs that the “elderly” could help society with: like keeping their communities clean, sharing in some childcare, teaching a unit in their subject area in schools, supervising parks after school, doing some “lighter” security work — keeping an eye out in other words for a few hours per week. Not so onerous for a Social Security check. Let the young ones get their needed education and work hard for all of us, like we do/did for ours. All societies will be better off. Stop the negative attitude towards more and more “elderly”. It’s like Pol Pot in disguise, actually. It is not that the reality of what should be done for the our energy policy it is that we must first remove the simpleton President and what is left in the senate to begin to act on a rational energy policy. Every day, month, year that goes by pursuing the AGW religion means that our energy infrastructure falls further and further behind the requirements for life in the modern world. The China’s and India’s of this world have not had their eyes clouded by this AGW social experiment and are bringing to their population the energy they need for an improved standard of living. The sabotage that Obama, Boxer, Pelosi and Lisa Jackson have accomplished against the US and our population in the name of AGW will take years to repair. Destruction of energy infrastructure is not a lofty goal. The destruction of jobs has followed, as the leadership has found the cliff to send the population on their journey downward while they have moved their standard of living above royalty. Under the Hatch Act, Jim Hansen should have been prosecuted long ago – during the Bush Administration, if not before. As a Government employee, it IS ILLEGAL for him to engage in the kind of political activity that he’s perpetrated. Sorry – don’t mean to shout, but I worked as a government contractor and I’ve known people who were terminated (from their jobs) for far less egregious offenses. The Chinese are currently paying $116/tonne for imported steam coal. Steam coal can be had for $15/tonne in Wyoming. The International Energy Agency now reports that global crude oil peaked in 2006! Lloyds of London (2010)is warning that a global fuel crunch is likely in the 2012-2015 time frame. With the US importing 65% of its liquid fuel, importing countries such as the US, Japan, Germany, China and India etc must focus on providing critical transport fuels to reduce the massive drop in GDP that will otherwise come with non-availability of fuels to import! Especially Brown on net exports. and Hirsch on The Impending World Energy Mess. We need to wake from the climate pipe dream and focus on critical reality of rapidly depleting oil with not enough to replace it. I was looking over those nuclear reactor figures, and, wow. What is Germany going to do? It has none planned or on order. I guess they’re going to continue burning coal forever or buying nuclear power from France, which is probably just as well. China looks to be in good shape for nuclear power if they build everything they’re proposing. It would be interesting to know if the power plants the Chinese are building are multi-use, i.e., can use nuclear, oil, coal, gas or geothermal as their heat sources. Apparently, that idea never caught on in the U.S.
As I started reading this item I was expecting to see a graph comparing the increase in atmospheric CO2 and the increase in coal fired plants in China with the uptick in James Hansen arrests. Sort of a hat trick of hockey sticks all in one graph! Surely someone has plotted those arresting moments. I don’t know if it’s global warming or what, but today will be 78 and I live 30 miles northeast of San Francisco. I’ve been trying to kill mosquitoes in my apartment all night, in NOVEMBER yet ! In a ” normal ” year, the Bay Area gets Indian Summer like temperatures twice a year, once in April & once in September. But THIS year saw us have temperatures of 105 degrees and set records for highs all over the area. Once the sun goes down, the temperature here has been dropping to as low as 40 in the middle of the night. Did anyone notice that Obama was over in India and never said word one about India’s contribution to pollution ? Nor has he said anything about any of the Far Eastern nations as well. I suppose that’s not on his list of ” top priorities “. The guy from NASA needs to stop blaming the US for burning coal and address the issue worldwide. I’m originally from Pittsburgh, Pa. and can remember when the skies were dark at noon because the steel mills were using coal as well as many of the houses and buildings in the city. The skies are much clearer in Pittsburgh today with all the steel mills having closed and the steel being made in China and Japan. May I apologise for the extremely vulgar image conjured up in the minds of Scotsmen all over the world by my comment at 01:09AM? All pollution is equal, but some pollution is more equal than other pollution. Industrialized America is already gone. Most of the heavy industry has been shipped overseas. We’re a service-oriented country now, importing far more than we’re ever going to export. When you have an American company named “Pride” who’s products are made in China, something’s wrong. I’m quite sure that Dr Hansen would protest the increasing use of coal in China, but I’m certain you would agree that his influence is considerably less there than in the US. In no way, however, does this take away from his main point , namely: CO2 gas in the atmosphere is resulting in increased warming and a host of derivative problems. SPPI and others have documented that these reports were orchestrated by a “green” group. No dissent was allowed and they all read about the same, with “cut & paste” parts evident. Interestingly, I just got back from a week in China for business. First time there. Did you know you WUWT is blocked over there? Couldn’t get my daily dose of sanity. Nice timing on this article. I was with my brother. He lived/worked in Beijing from ’89 (just after Tianamen) – 92 and has been involved extensively over there ever since. He talks about how much cleaner it is now compared to then. Back then, everybody was burning coal directly in there little huts for heat. Now of course it is mass burned at plants and the resulting electricity is mass distributed. I won’t talk about what they did with bodily waste. China is essentially going through what North America did 80 years ago. It will continue to get cleaner. It’s population is demanding it and the gov’t recognizes it. The difference is the population remembers where they were 20 years ago and realized things have improved extensively. One thing I will say, is if North America doesn’t get its head out of its derriere with respect to energy, China is going to have a grand time burning coal to make the subsidy sucking windmills and solar panels they will sell us. The only carbon reduction they will do will be economic based and producing what I’m sure will amount to be subsidy sucking carbon capture and storage contraptions in whatever form they take. If we don’t smarten up, they will have us for lunch. Next thing you know, they’ll be exporting all the intellectual property, (our bread and butter), too. D Archibald says above “..China has 1.006 trillion tonnes of coal, about four times that of the US…”. Something doesn’t match here. According to BP’s listing of proven recoverable coal reserves, USA has about 246 Billion tonnes or about 27% of the world reserves. Followed by Russia at 17%, China at 12.6%, India at 10%, and Austraila at 8.6%. Looking at the grades of coal in each reserves, on a BTU basis, it appears that the USA would have an even larger share than China. So, from that listing, five countries contain about 75% of the world’s reserves. Regardless of the opinions about whether AGW is correct or not, the idea that the people who support AGW are purposely hurting development is not valid. If one believes that AGW will cause flooding in certain areas, and desertification in other areas, the people who will suffer the most are in the less developed world. This is true for Pakistan and Bangladesh who have been hit with devastating floods, which are supposed to become more frequent as AGW proceeds.Also areas of Africa and China will be plagued by drought. Finding alternative sources of energy that don’t cause AGW, and conservation is a good idea even for the less developed world, assuming AGW is correct. It is of course very satisfying for some opponents of AGW to label the proponents as somehow evil or stupid because they should know they are harming the interests of underdeveloped countries, but that is not a correct characterization. Alex the Skeptic: Bravo! Excellent summation of the left’s desire to return to the “Good old days”. Thanks Anthony, very kind. I loved the two graphs too, they pictured so well the CO2 future. “At the moment we as a nation are turning up to meetings with the bank manager in jeans and a T-shirt that says: ‘Jesus loves you’,” he said. I wonder how long that schtick will work (developing country). We have been getting “boogey man” stories of them becoming the #1 world economy in as little as 2 years time. So if #1 is developing, then aren’t we all? It is Hansen’s right as an American citizen lawfully to protest the coal industry. That right does not extend to the use of his well-paid government job as a bully pulpit. For this and a laundry list of other reasons I sincerely hope that our new Congress finds a better use than GISS for our tax dollars. From the first graph, coal use in the “developing” world has skyrocketed, currently on a fast-rising curve starting from around 1998-99 but a similar one was going until 1996-97, with a brief slightly-decreasing period between them. This matches up with findings revealed by Dr. Phil Jones in February 2010, that there has been no statistically-significant global warming from 1995 to the present, and a non-statistically-significant negative trend (possible global cooling) from January 2002 to the present. 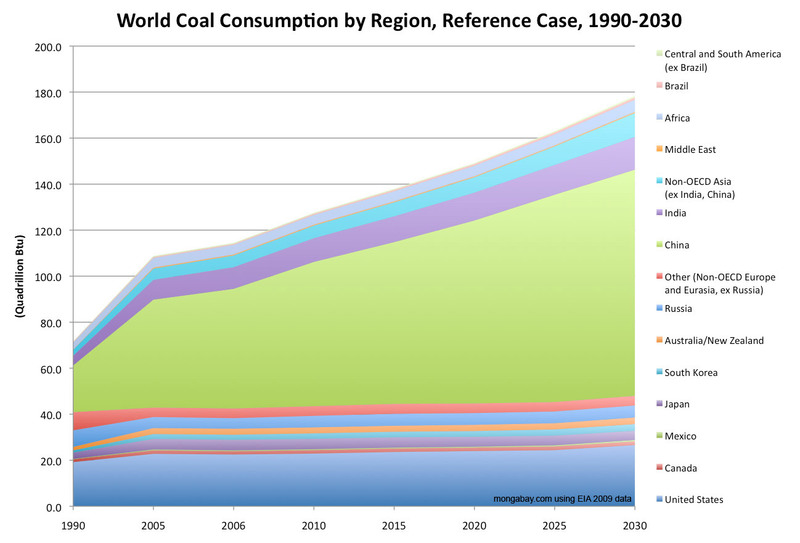 Coal use goes up, CO2 and likely other emissions go up, global temperatures stagnate. Of course, for climate science purposes, at least another twenty years or so of observations will be needed to confirm there is a possible cause-and-effect relationship present, and to reveal if there really is a true statistically-significant cooling trend. As a general observation, it looks like we’ll get those twenty years, at least. If you want him to go, buy a round trip ticket. Don’t worry, if he does protest, it would be a one-way trip. Coal is great for cheap power, no doubt about that. However, there are serious problems involving mercury, radioactive U and Th, acid rain (S scrubbing helps), and soot. Fly-ash is radioactive and has a peak of size distribution in the right range for efficient deposition in the lungs. I am aware of no studies of the potential carcinogenic properties of coal soot. The focus seems to be on radioactive radon gas, which is actually silly if you think about it. Good ventilation solves the problem since it doesn’t stay in the lungs. Wind and solar power are very expensive, and require an invasive smart grid. The smart grid network penetrates your home and business. Some new computer power supplies network with smart grid through the power cord and provide a new route of potential hacking you might not be aware of. ‘Data mining’ via smart grid is unrestricted in the Energy Independence and Security Act of 2007. Nuclear power is the right alternative. However, we need to begin thinking about integrated fast reactors (IFRs) instead of even the current new designs. Solving the waste problem requires either reprocessing or IFRs. Yucca Mountain should have been closed, since burial of the ‘waste’ would be a terrible waste. Typically, 97% of the uranium load is unused. IFRs can burn almost 100% of the fuel load and eliminate most of the actinide fission products. They can burn thorium as well as uranium. Many designs are smaller, even air cooled, and thus are much safer (est. 1000 times safer). These typically use liquid sodium or liquid fluoride to transfer heat from the reactor to water. They have naturally safer emergency shut-down properties that don’t require elaborate plumbing. They don’t need vast volumes of water for cooling. Construction time is short, and thus, they are far less expensive to build. We have enough U and Th now to last for centuries. “Industrialized America is already gone. Most of the heavy industry has been shipped overseas. We’re a service-oriented country now, importing far more than we’re ever going to export. When you have an American company named “Pride” who’s products are made in China, something’s wrong”. I don’t agree with your point of view. The US still has it’s power generation industry, cement industry, steel industry, chemical industry, arms industry, off shore industry, glass industry, we still produce heavy equipment, cars, aircraft etc, you name it. the factual situation. We have a lot to loose. Save your money and buy him a one-way ticket. If he protests in the PRC like he does everyplace else, he’ll have a long stay. I am familiar with modern coal firing systems (both smaller industrial boilers and power stations pulverized coal fired boilers) and apart from CO2 emissions (probably minor environmental concern if not completely irrelevant) other real pollutants (particles, CO, NOx, SOx…) are relatively easily controlled and kept reasonably low at relatively low costs. He won’t go to China, he knows there’s a chance the Chinese will take him seriously and lock him away for the rest of his natural as a threat to their state. I suppose there may be an upside to an overmighty government after all! China’s cheap and easy coal is already gone, just like the cheap and easy oil in the US. US oilproduction peaked in 1970 and has been falling since. China’s coalproduction will peak in 2011 (maybe 2012) and will start falling after. This is all so very troubling. Will the wonder of “Life After People” ever come about? What a beautiful planet it would be. They have some shale gas deposits that are staggering. The Strategic Research Centre for Oil and Gas of MLR also set a goal to locate one trillion cubic metres of recoverable shale gas reserves, build 15-30 billion cubic metres of production capacity and produce 8-12 percent of China’s natural gas from shale gas wells by 2020. Yes, it says there is one in the US, but that one (Watts Bar 2) was started more than 30 years ago, then abandoned, then restarted. Of course China signed the Kyoto treaty; it requires them to do NOTHING (as a developing nation) to clean up their act, while it hobbles their competitors. Hansen works for NASA. The head of NASA said their purpose is outreach to Muslim countries (http://www.csmonitor.com/Science/2010/0714/NASA-chief-says-agency-s-goal-is-Muslim-outreach-forgets-to-mention-space). Muslim countries export oil. This is why Hansen is protesting against coal – he is surreptiously promoting oil to help increase Muslim exports. Since the subject of coal – and by inference, alternatives thereto – here’s an interesting report just out . Renewable Energy Committee of the National Agricultural Research, Extension, Education and Economics (NAREEE) Advisory Board http://www.ree.usda.gov/nareeeab/reports/062510rec_final_report.pdf . USDA/REE should validate the development of a cellulosic feedstock system and determine which feedstocks indicate significant sustainable potential in various regions of the US. After two decades of research without a sustainable technical breakthrough to make cellulosic ethanol competitive, it appears that it is time to reevaluate the research. There are two additional options for consideration. First, cellulosic biomass to power (burning to produce electricity) has real potential for being a useful bridge for cellulose to ethanol. With this approach, it can at least be demonstrated that large amounts of cellulose can be grown, harvested, stored, transported, and used to produce electricity. So to translate – lets burn the trees (etc. ) down for electricity to see if we can grow them fast enough to make ethanol. And if you don’t think that trees are on the menu, think again. I’ve already had a discussion about this with the CEO of a new ethanol plant going up near me, since I have some acreage in trees. The rest of the report discusses other feedstocks, each with their own set of problems in terms of growing, harvesting, transporting, conversion, etc. Given the number of climate zones in the US, different feed-stocks must be grown in different regions of the country. Primarily, growing feedstock is outdoor manufacturing, so the production is always at the whim of the weather. Having diverse biomass production systems spread over many states will lower the risk of the system and assure an adequate supply. With many different feedstock crops being grown in different climates, the production system gives almost every state an opportunity to provide renewable fuel for this country. Other advantages include the use of existing infrastructure for these new crops, and utilizing local labor and other resources. Nice spin on this part. Following the above logic, we should eventually be growing our own in our backyard garden and running it thru a still. Not exactly new technology there. Just ask any moonshiner in the South. 😉 ‘course the city folk might be at somewhat of a disadvantage. Tough cookies. Thanks, just was thinking aloud and trying to do my little bit to ACTUALLY SAVE THE PLANET from those who think they want to save the planet. 2. By letting the poor starve to death. The hypocrites choose the second option. We choose the first option. And the planet loves CO2 as is being proven by the biosphere itself: More biomass, more food, less poverty. Repeat: Hansen et cohorts should be tried [f]or crimes against humanity. Repeat: Hansen et cohorts should be tried FOR crimes against humanity. Fun to read all about China, here (in China) this website is blocked and it’s almost impossible to reach it. Finally I found the method, a public VPN client and the public server in Japan …. LOL!!! Phew, it was empty mouth too, thank God. It would be good for him to go so he can be greeted with the same tone President Obama was greeted with. The manufacturing we still have is a shadow of what it was only 30 years ago. That’s a fact. Our steel industry isn’t what it was, don’t know about glass, aircraft are produced in many more places now than in the US, we’re not the leader we once were. Outside US, the rest of the world has long way to go to catch up with US in terms of Energy used and Waste generated on per capital base. Don’t you know there are still millions of people in China and India that don’t have electricity at all. The reports in the link you refer to were produced by SPPI, that’s where I got the 13 day mention. Hmm, maybe not, they say 1/20 of a year and China would replace all off our savings. You may be thinking of another set of reports that I saw in relation to the task force, but the product of the task force was pretty much done from scratch. There’s a more recent report released by the state chapters of Environment America, but the only uniquifier was the state organization’s logo. I see Jimbo is still wearing that “Bwana Bill” sun hat that nearly covers his ears. Somehow, I don’t think those glassy eyes lit up with an unnatural glow and peering out from under that ridiculous hat brim convey the serious image Dr. Jim imagines. Whatever are you talking about? Jimbo gave a couple of citations. That’s all. BP are sloppy about their drilling practices, and they are sloppy about their statistics. If you read the Oil Drum article, there is a reference to the China figure of one trillion tonnes. Jimbo has a messiah complex. He’s one of those highly educated, intelligent guys I’m always harping about who cannot distinguish truth from fiction even on a good day. As a result, they believe whatever they wish to believe and use their superior education and intelligence to fabricate an imaginary technical world of their own making. In his mind, Hansen is leading “the people” out of a wilderness they are too dense to comprehend. He rides a white horse and blows a golden trumpet, both of his own making. He’s now reduced to hobnobbing with the lunatic fringe because his fantasy no longer plays well in many high places. Yet he still remains in a very exalted position within the government, where you and I pay the freight. I do think you guys are too generous as far as Hansen’s passage to China goes. Seeing that he is hankering after the ‘golden stone age’, how about a nice galley a la Ben-Hur? I am offering to beat the drum whilst we get some volunteers to do draw staws to do the whipping! There is a reason why they dont protest in China. Because China would “get rid” of them. We are the largest and weakest prey. So they will assault America first. Divide and Conquer. Indeed. They remind me of the old joke where the american claims to live in a free society where “We can stand outside the whitehouse and criticize the president!”. And the old soviet replies “We are free too! We can stand in Red Square and criticize your president too”. Thoreau was a brave and honorable man. One who looks for a dime around the corner because the light is better is just a coward unsure of his convictions. Could someone castigate the creators of these charts.. PLEASE. Why can’t anyone start from ZERO. Gotta make it look REALLY big, so lets squish our axis.